I was going to post some thoughts on the BUGG Study (and I did put a quick summary into an F1000 recommendation). However, I have little to add to the authors’ own discussion, Preeti Malani’s editorial, and Mike’s previous posts. In short: a great study that advances the field, and given the mixed results (primary versus secondary outcomes) it will be hypothesis-generating but not practice-changing. I do, though, have a couple related observations. First, we should stop conflating methicillin-resistant Staphylococcus aureus and vancomycin-resistant enterococci, whether for study designs or for prevention strategies. They differ too much in preferred ecological niche, inherent and acquired resistance mechanisms, virulence, epidemiology, and almost certainly also in relative effectiveness of prevention strategies. The authors include some discussion of this point in the paper. Second, the hypothesis being tested in the BUGG study is definitely swimming upstream, against what I perceive as slow movement away from contact precautions. Mike has posted about their new approach at VCU, but other centers have also moved away from the CDC’s Management of Multidrug-Resistant Organisms guidance regarding use of contact precautions. I’m on an informal e-mail group of academic hospital epidemiologists, and last week one of them asked whether centers were still using contact precautions for Escherichia coli-extended-spectrum β-lactamase producers. The responses provided further evidence for a move away from isolating for E. coli-ESBLs, MRSA and VRE in some large academic centers. I suspect this represents the tip of the iceberg, particularly as hospitals seek to improve their patient satisfaction scores. 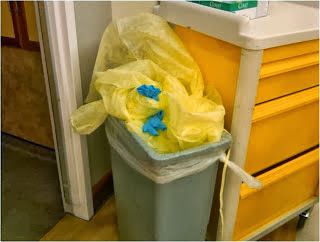 Of course, there’s a big difference between an ICU-specific universal glove-gown intervention and hospital-wide, microbiology-driven contact precautions use, and it is easy to hypothesize why the former would work better than the latter.